Fascinator for bridal, minimalist Hairpin, woman wedding bun for a special occasion hat. I offer a variation of the work around small textile jewelry that you can wear at a wedding, engagement, for a sequined party.. .or as a gift for a loved one. The beige version: work floral Japanese minimalism inspiration for this hair pin, this hairpin made of woven paper covered with cellophane white-beige colour, known as "straw love". The diameter is 11/7 cm. 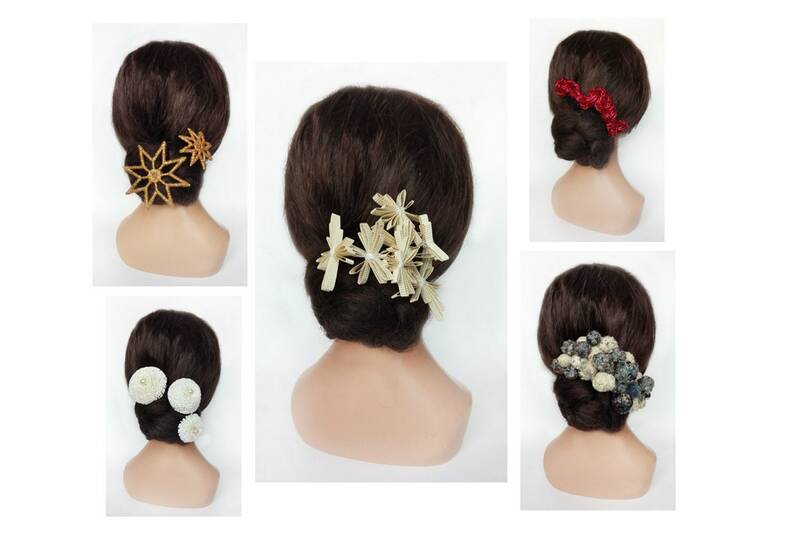 To accessorize with a designer touch your hair in all occasions, wedding, engagement, cocktail, or as a suggestion of gift for a loved one. The white version: bouquet of 3 hair pins or Bobby pins, to accessorize your hairstyle of ceremony. Picks are made of imitation pearl beads and white raffia fringe. The diameter is 4/5/7 cm respectively. Gray version: made of wool ball and wire, with minimalist hair accessory for majority, beige and grey. Keeping in the hair is done with 2 pin hair. The diameter is 15/8 cm. The Red version: minimalist pique, bun, stick PIN or hair pin made from shiny red cord. The cuff is 12 cm long and is mounted on a long 7 cm and golden hair pin. To create a bright, graphic and minimalist detail in the hair. For version Gold: hair pin made from a gold/brown color thread embroidered star. A detailed Star in the hair that is sure to make its effect on all occasions. The diameter of the star is 8 cm. For hair accessories also while light and one point its daily minimalist chic.